Keeping accurate records is essential when running your own business, especially a small business where every penny counts. If you feel that you are unable to deal with this area of running a business then you have the option of employing a bookkeeper, but bookkeeping is a skill that can be learned. You local college or business link will be able to advise you on local courses. 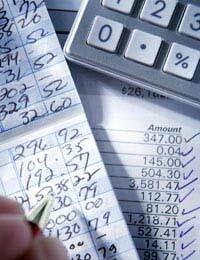 his is the traditional method of bookkeeping, where every income and outgoing is entered by hand. Some companies still employ this method, and although computers make bookkeeping easier, physical books are safe from computer crashes and are easily accessible when the VAT man comes calling. For basic bookkeeping you will need to buy either a triple or double entry book. These are readily available in all stationary shops and it is personal choice which entry system you prefer. Don’t spend a fortune on these books; a low cost option is acceptable. You will need three books; cash, sales and purchase ledger. This book will become your bible. Looking at it will be able to tell you at a glance where your company is financially. It will list all the money in your business account. The book will list all payments into the account and well as all money going out. It is important that this book is kept up-to-date. You can get your accountant to help you maintain the cash book. It is essential that your cash book entries start on the same day as you start your business. This book will list all your invoices in numerical order. It helps if you keep the invoices divided by month to make it easier to find invoices when required. You will also be able to spot trends, such as high sales months and low sales months where special offers may be needed to encourage new business. Keep one section for invoices that have remained unpaid as this will help you to chase payments from these customers. This is not necessary for businesses that sell item directly to the public from stock or where the items are purchased from a stall or fair. This book will list every item or utility that you buy for your business. . For all your outgoings it is imperative that you keep ALL your receipts as the TAX office will require them as proof of purchases. It is essential that your purchase book balances with your cash book so take care to ensure that all your outgoings here are also listed in your cash book. When you pay for an item remember to write the date and method of payment on the invoice and, if possible, always request a receipt. Computerised bookkeeping is becoming increasingly popular with small businesses. The only drawback to this method as opposed to using physical books is that you need to back-up your files on a regular basis away from the computer to prevent it being destroyed should your computer crash. There are several great bookkeeping software programs for the PC and many are available as a trial download from the internet. Try a few and when you have found the one that you are comfortable and that suits your needs then you have the option to purchase the software. As with books it is essential that you keep them updated to ensure that you know where your business is at all times. Remember, failure to keep up-to-date accurate records could result in high fines from the authorities. Your accountant will help you to stay the right side of the law.